We actually kind of knew this, but now we know it for sure. As for the Marchen DVD&Blu-ray, we do not make limited edition this time. DVD/BD will only include the main setlist (Ido e itaru Mori e itaru Ido, Märchen) and there will be no encore nor member presentation. Totally bad news, but ―at least me― I’m still getting it. I wonder whose decision was this… King Records? Rap Products? Personally, I don’t think that Revo wanted that himself (but who knows). If you also want to get the DVD/BD, be sure to check the banner on the lower left! 😉 ! 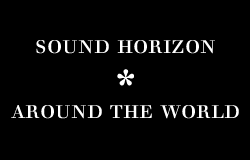 Sound Horizon Korean Debut confirmed! 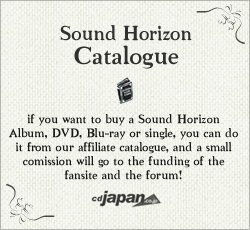 Finally, the first live show by Sound Horizon in Korea has been confirmed at the Japanese Official Website. That is absolutely good news for us! (after all, this is an international fansite!) and I hope that all Korean Laurants can get a ticket for the show! Time: 17:00 door opening / 18:00 curtain rise. Musicians: Takeshi Nishiyama, Shingo “Jake” Saito, Atsushi Hasegawa, Ryuuichi Katsumata, Ken☆Ken, Choi Song Il. Definetely good crew! We wish all the best to the band on its overseas live debut. It has been confirmed that the movie screenings and the stage greeting cancelled due to the Tōhoku earthquake and tsunami have been rescheduled for June. Revo will be in Miyagi on June 14th for the stage greeting. Also, it has been continuously reminded that there will be concerts in the Tohoku area scheduled in the future, as part of this year’s live tour: 1st Invasion of Territorial Reconstruction, which takes the disaster relief efforts as its leitmotiv, and will have a portion of its earnings donated to the Japanese Red Cross.